I am going to try to get and keep caught up with my projects and paperwork this year. What about you? 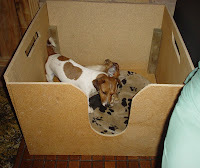 Coming up from the House of Odgers... two more titles in the Jack Russell Dog Dectective series, "Fowl Play" and "The Blue Stealer", two books in the Pet Vet series, "Cranky Paws" and "The Mare's Tale". (Scholastic Australia.) 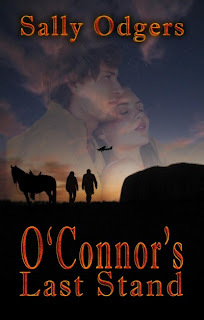 Two books by Tiffany Mandrake, provisionally called "Flax" and "Mal" (Little Hare), and a novel called "O'Connor's Last Stand" from Eternal Press. As a manuscript assessor, I know a lot of first time (and tenth time) writers make mistakes. Some of these are basic mistakes that are obvious, once pointed out. Unfortunately, they're obvious only to someone who already knows the score. Since the same problems pop up over and over in manuscripts from widely differing authors, I coralled some of them in writing guides which I self-published through http://www.lulu.com/ . Self-publishing let me get the guides out right away. It gives me the right to sell tem directly, and also to revise them whenever I choose. They are available as PDFs or as paperback books. Titles include "Writing a Picturebook Text" (what to do and, even more importantly, what NOT to do), "20 Top Tips - the Unwritten Rules of Writing", which is a distilation of all those errors I've met, and made, in nearly 40 years of writing, "Writing Metrical Verse", "Creating a Fantasy Setting", "Writing a Manuscript Proposal" - and five guides that cover Ideas, Plots, Characters, Style and Dialogue. These guides are available from the Affordable Manuscript Assessment site at http://www.affordablemanuscriptassessments.com/workshops.html or directly from http://www.lulu.com/sallyodgers . Rules:Link to the tagger and post these rules on your blog. Share 5 facts about yourself on your blog, some random, some weird. Tag 5 people at the end of your post by leaving their names as well as links to their blogs. Let them know they are tagged by leaving a comment on their blog. 1. I really hate it when people put "your" when they mean "you're". 2. I really hate it when people put "it's" when they mean "its". 3. I really hate it when people bestow an apostrophe on every s.
5. I do not like tinned spaghetti. a whole lot to the mad imaginations of Team Eternity! Julia Eternity, the Thing and Me is a free serial thriller available at the Eternal Press Website. Click on the url below for an instant fix. Welcome to Robyn Opie, author of The Pony Game. Robyn has agreed to answer some inquisitive questions. 1. Was the title for this story always "The Pony Game", or was it a changed or last-minute choice? The title was always "The Pony Game". I decided on it at the time of developing the idea, shortly after writing my non-fiction book "Looking After a Pony". I've had very few titles changed from my original ones. 2. Do you think the popularity of pony stories has changed since its heydey in the 1960s? No. The books and stories have obviously changed with the times, but not the love of ponies/horses. I think children have the same interests, though technology has introduced many new ones. However, when I queried Era Publications with this story line, it was rejected as unsuitable for the US market. Apparently we have to write for urban US children and keeping ponies/horses is not for them. I was a little surprised as I thought the fascination with ponies/horses was universal. I think this rejection stemmed from the fact that the US publisher Era Publications works with wouldn't purchase my non-fiction book "Looking After a Pony". Therefore Era Publications were avoiding pony stories. 3. Part of "The Pony Game" is role-playing... Black Beauty is inserted into the role of "pony". This role/substitution is a surprisingly common habit with real-life children, but is not often addressed in children's books. Do you think your protagonist is a writer-to-be? Yes, I think my protagonist is a writer-to-be. Me! After writing the story, I realised how much of my childhood was reflected in the story. I grew up in Port Pirie, a regional city in South Australia. Behind my house was a horse stable. I used to walk the long way home from school so I could visit the horses. I used to climb my back fence so I could look at the horses. For most of my life, I've had a dog - different ones, of course. When I was young, I played games with my dog "Boots". I even played the pony game. My favourite animal has always been the dog. My best friend at primary school was mad about horses. Put it all together and you have "The Pony Game". In a lot of ways the protagonist is me, growing up in Port Pirie. 4. I read somewhere that pony stories are the precursers (sp?) of light romance, with Pony in place of Handsome Hero. Comment? I guess I can see that. Ponies/horses usually have that "handsome" look to them. And, of course, our Prince Charmings are supposed to ride on horseback and whisk us away to some glamorous life. I wasn't thinking of any of this when I wrote "The Pony Game". A confession - I tried writing romance many years ago. I prefer children's stories. So I'll stick to ponies/horses as the handsome heroes. 5. You did quite a lot of rewriting and restructuring on "The Pony Game". Did you feel this improved the story, or did you do it because that's what others wanted or suggested? The story itself didn't change much. But I rewrote and restructured for different publishers. The first series I submitted to was Puffin's Aussie Nibbles and the word count had to be between 1,500 and 2,000. My second submission to Walker Books was a long short as I suspected the story would be too short for them. Third time is the charm, so they say. I rewrote the story up to around 2,500 for Lothian Books' Giggles series and it was accepted and released twelve months later. I believe this is the best version of the story. That may be because it's the version I'm most familiar with now. But I think the extra 600-700 words added to the depth and characterisation. 6. How do you classify The Pony Game's genre? It's certainly not the classical pony story, but would you call it "family", "animal", "problem" or just plain "story"? The first time I saw "The Pony Game" in a bookstore it was under the heading "Classics". Great, I thought. It's a classic in its first month of release. "The Pony Game" was shelved with other horse stories under this general heading. If I was to classify "The Pony Game" I'd call it "animal". 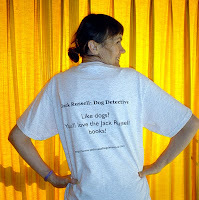 The protagonist's dog, Black Beauty, was the main focus for me, being a big dog lover. I was more interested in Lucy's relationship with her dog because, again, the story reflects me as a child. For Day 1- Mon 10 Dec - visit Tina Marie Clark's What is Happening in my Office? Day 3 - here at Spinning Pearls. I'm delighted to welcome author Tabitha Shay to Spinning Pearls. Tabitha is the author of the hot new romance Witch's Brew, published by Eternal Press. Q 1. Tabitha, all readers are fascinated by the writing process. I'd love to know what came first for Witch's Brew. Did you envisage the plot, or did it start with a character? If so, who or what? A tiny bit of the plot came to my mind first, then I developed the character, Saylym Winslow, from there the entire plot began to take form in my mind. Q.2. The image I carry in my mind is of Saylym's hairbrush behaving in a very weird way. How on earth did you get the notion for a talking hairbrush? A2. I wanted things she used every day to suddenly come to life. Just imagine how shocking that would be for someone. A hairbrush is such a personal item and one of the first things we use of a morning and I wanted the action to start fast, so I thought this was good beginning. Q.3. You use the term "waken" for a male witch, and "warlock" for a bad male witch. Did you invent the first term, and if not, where did you find it? A3. Yes, I made up the word "waken"because I'd learned that some editors felt like a male witch was still a male witch and warlocks were considered evil. But for my story, I wanted readers to have a way to distinguish the female witch from the male witch, so I came up with the word, "waken" to represent the male and left the word "witch" to represent the female of the species. Q.4. How did you come up with the names of the characters? Does Saylym's name echo the place called Saylem? A4. Actually, I have a niece named Saylem...and I always thought is was a cute name and would sort of fit a witch story and have my lead character named after Salem Village as well, so I changed the spelling a little to make it more unique. Thanks, Tabitha. You're very welcome and it's been my pleasure. Thank you. The Witch's Brew Book tour continues! On Wednesday visit http://mizging.blogspot.com/ for another interview. On Thursday, it's Sloane Taylor's blog at www.myspace.com/sloanetaylor . Books must be promoted by author, editor or co-author. Each book can be promoted once a month. Books and publishers are given a level playing field. Everything, from self-published books to Harry Potter 8 (well...) is given equal value. The only books excluded are those designed to spread or create hatred, and those for 18+ readership (but see above). Book covers may be uploaded at the group site. Four generations of women, linked by blood, parted by fate. Eva Kawolska - the Polish war widow. Eva escapes the devastation of occupied Poland and brings her child to the promised land of Australia. Terenza Rhodes - the deserted child. Raped by her uncle, Terenza flees her home town and journeys across Australia during the heady days of rock 'n' roll. Emma West - the good girl. Brought up to believe herself an orphan, Emma is shocked to discover her mother may still be alive. Philippa Freedom Darcy - the lucky one. The legal barriers are down… but can she mend the links and reunite her family? Freedom was published by Eternal Press on Dec 7, 2007. Dogs. One of ours is gnawing a bone in the bone box right now. In the old days, publicising books was the province of the publisher. That's still so in many cases, but these days most authors feel obliged to do a bit of self-promotion. 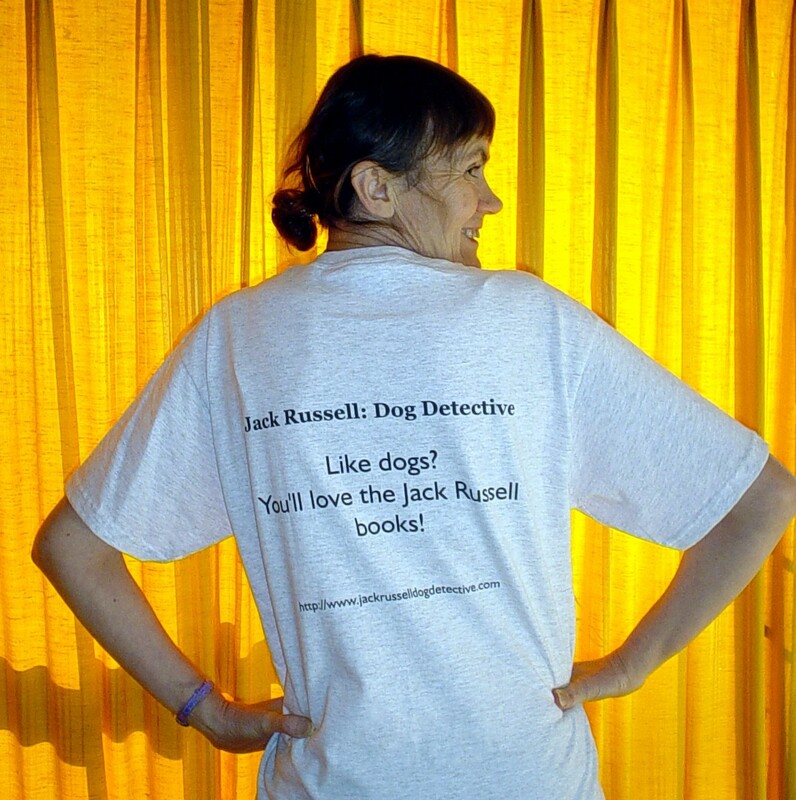 My writing partner and I have found one good and relatively cheap way to advertise the Jack Russell: Dog Detective series. We had tee-shirts printed with an advertisement. Instead of using a cover image, we used a big photo of OUR JR on the front, with the series title above him. On the back, we have the website and a simple slogan. If I wear my shirt in public, not many people react. If we BOTH wear our shirts, people do. They know, because there are two, that it's not just a random dog picture. All kinds of people comment, which means one of us will turn to reveal the slogan. People read the slogan in queues, too. If anyone smiles, comments or even gives us a second glance, we whip out a business card with the picture and slogan and website on it, and tell them they can read the story behind the story right there. 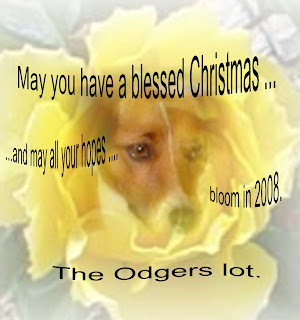 Granted, the dog angle is easier to "use" than some other works would be. For example, if I had my GOLD'S BRIDE slogan, "WIFE FOR SALE" on a tee-shirt, and wore it in public, it might cause a rather weird reaction. I am, after all, a wife. I am also 50 years old.